Back in Bristol for Christmas, it’s fascinating to see how much the city I was born in has changed and how much hasn’t. Bars, pubs, restaurants and shops I once frequented have disappeared – either replaced by new businesses or now boarded up. 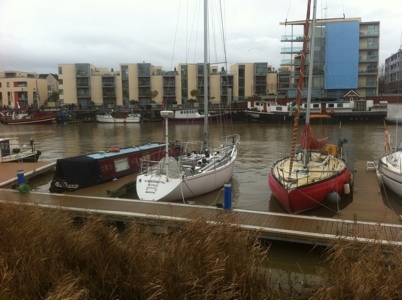 Bristol, like other parts of the UK, has been hit badly by recession and the associated fall in consumer spending. But perhaps what has most caught my eye is the news that the Bristol Ferry Boat Company has gone into liquidation. Although there were attempts to save the business, the services taking passengers around Bristol harbour have ceased and its five boats, with their familiar blue and yellow liveries, have gone to auction (this morning I saw them moored opposite the SS Great Britain). While the closure of the company doesn’t affect the services operated by others, including Number Seven and Bristol Packet, its failure is still significant. It will come as a particular blow for newly-elected mayor George Ferguson as he was a shareholder. 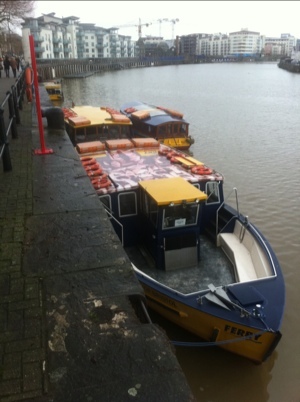 Bristol Ferry Boat Company was founded in 1978 (although the City Docks Venturers, a non-profit making conservation group, had started services the water taxi services the previous year) at a time when the harbour was one of the less desirable parts of the city. Warehouses and many other commercial buildings stood as shells, left redundant when the water was closed to commercial traffic. The City Docks Venturers and Ian Bungard, who originally set the business up, were among those helping to make the harbour the bustling place that it is today, a district where people would choose to live, work and go out. In the 35 years since the Bristol Ferry Boat Company first started services, it has been transformed into one of the most fashionable parts of the city and is now really popular with leisure craft who grace the waters. Having been born five years after the business launched, I’ve witnessed many of the changes. The popular science museum, At Bristol, was opened at the turn of the millennium in a dingy former railway shed, after considerable money was spent on restoration of the listed structure. As a child I remember the structure was used for little more than a weekly car boot sale and the area outside was one giant open air car park. The first-class arts centres Watershed and Arnofini, housed in a former warehouse and granary respectively, are thriving. Stylish bars and restaurants have opened and, unlike other parts of the city, the units largely remain occupied (Bordeaux Quay is particularly celebrated by foodies and there is also the largest restaurant in the South West, Za Za Bazaar). More recently, a major museum called M Shed, which celebrates Bristol’s fascinating history has opened – and in my opinion is one of the best museums in the whole of the country. Brunel’s famous SS Great Britain, “the ship that changed the world” is also moored in a dry dock at the harbour. There is now barely an inch of land along the waterside in need of development, given the extensive apartment and office building programmes of recent years. And even when it rains and the winds are strong, as has been the case today, the harbour still is amazing and looks like a suburb which has been established for centuries. Bristol Ferry Boat water taxis have been a constant witness to this change over the years. Commuters and leisure passengers alike have boarded from the 15 jetties, stretching as far as Temple Meads, around the harbour. Sadly though the recession (and the bad weather last summer) has taken hold and the owners just couldn’t keep the business afloat. People have been getting very sentimental in letters to the Bristol Evening Post about the closure of the company, but it’s important to remember that services will continue by other operators. And Bristolians and visitors alike must ensure that they give these businesses their support. Walking around the harbour today you’ll see that it is more than able to stand on its two feet. We should never however forget the leg up that those pioneers gave it 35 years. It’s sad that the Bristol Ferry Company is no more, but whatever happens to the boats they’ve played their role in transforming a fascinating part of the city.